I have been spending this summer in Washington, DC as a Foster Youth Intern for the Congressional Coalition on Adoption Institute. Foster Care Alumni of America scheduled and planned a boat cruise for a few of the foster youth interns. On this cruise, I had the opportunity to meet Brian Samuels, the Commissioner of the Administration on Children, Youth and Families. He was selected by President Obama himself to work in the Obama Administration. We began to talk at the beginning of the cruise. Some of the things we were talking about were related to the funding of the foster care system. I talked to him about the work I was doing in Rep. Jim McDermott’s (WA-07) office, which was focused more on extending the waiver program to Washington State. From then on we got into a very deep conversation about the real issue of foster care. Initially Bryan told me that he was not convinced that the waiver program would bring upon the change that I had expected in the foster care system. He said that if states were not motivated to improve the system with all the funding they receive now; why would they be more motivated with looser uses of the money. When I heard that I changed my entire perspective on how I saw the financing of the system. It was clear that not everything was so black and white and what I thought was the solution turned out not to be the solution at all. 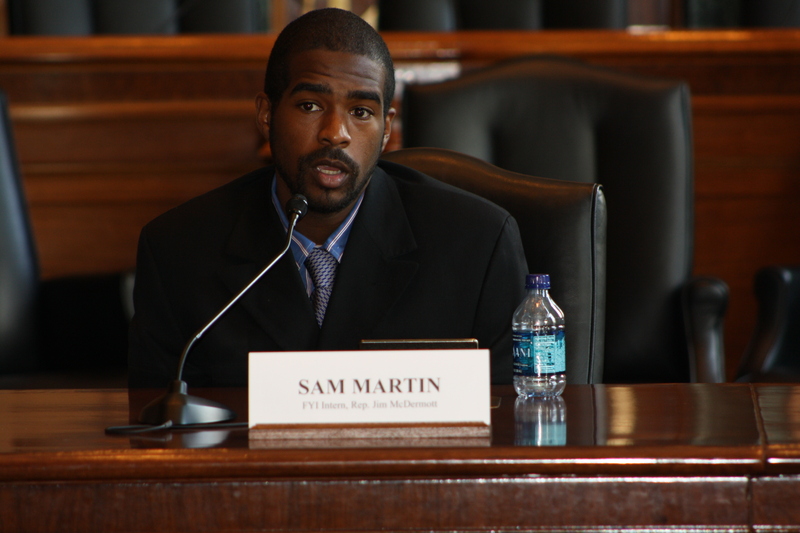 Bryan Samuels opened my eyes to the biggest issue of the foster care system. People will cross-reference and find data in all these different areas of the foster care system but that is the same as trying to compare apples to oranges. He said many of the issues that surround the foster care system cross multiple different issues. Bryan spoke to me about his experience about being the Chief of staff for the Department of Education. He talked about how in the education system people would figure out the problem but not focus on it. He correlated it to the fact that if kids don’t get to see siblings let’s not keep looking at why kids don’t get to see siblings. Let’s focus on allowing kids to see brothers and sisters. This experience made me realize that I don’t have all the answers and also allowed me to expand my horizons. It was also a great honor to meet Mr. Samuels. It is also very good to be able to see the potential flaws in the suggestions I have made. I know that it doesn’t discredit me at all but I know now the other side of the argument and I can look for potential flaws in my proposal. Without the opportunity to talk to Mr. Samuels none of this would have been possible and the CCAI report would have been just a little less prepared. Thank you again Foster Care Alumni of America, Orphan Foundation of America, and CCAI.